His writings and the founding of the Children & Nature Network focus on how to get children, families, and adults to have nature be a part of their lives. This luncheon will lead the way in our region for parents, teachers, and health professionals to enthusiastically join in the movement to encourage interaction with nature and the benefits of leading a nature-rich life. A Q&A session and book signing will follow after Mr. Louv’s presentation. Books will be available for purchase at the event and at the Fontenelle Forest gift shop. To purchase tickets please click here. 100 actions you can take to create change in your community, school, and family. 35 discussion points to inspire people of all ages to talk about the importance of nature in their lives. A new progress report by the author about the growing Leave No Child Inside movement. New and updated research confirming that direct exposure to nature is essential for the physical and emotional health of children and adults. 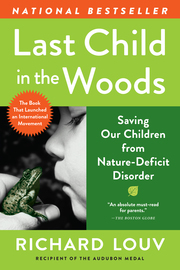 Check out this five-minute introduction video with Richard Louv about the concept of Nature Deficit Disorder and the importance of re-introducing children and families to nature. 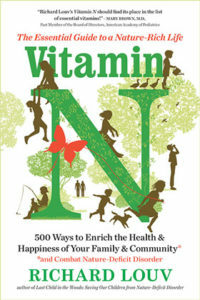 Vitamin N is a one-of-a-kind, comprehensive, and practical guidebook for the whole family and the wider community, including tips and essays not only for parents eager to share nature with their kids, but also for adults without children of their own, for policymakers, religious leaders, teachers and pediatricians; and for those seeking nature-smart schools and even careers. It is a dose of pure inspiration, reminding us that looking up at the stars or taking a walk in the woods is as exhilarating as it is essential, at any age. Recommended by the National Science Teachers Association. See all of his books here. Reserve your spot at this first-of-its-kind Bellevue luncheon here!